Two high-speed railways opening on April 1 will dramatically slash travel time between the hinterland and the coastal regions, a senior railway official said yesterday. Stretching more than 350 km, the Hefei-Wuhan passenger railway, along with the Hefei-Nanjing lines opened last year, will provide the shortest link between Central China and East China's Yangtze River Delta region. Graphics by China Daily, March 25, 2009. "Riding a bullet train at 250 kph from Wuhan to Nanjing will need less than three hours, almost eight hours less than now," said Zhang Shuguang, chief of the transportation department of the Ministry of Railways. Passengers traveling from Wuhan to Shanghai will also benefit, with travel time cut in half to only four hours and 45 minutes, he said. 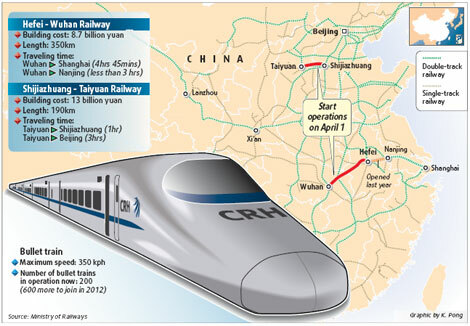 The other new high-speed railway is the 190-km Shijiazhuang-Taiyuan railway linking the north and the west. Zhang said the travel time between the capital cities of Hebei and Shanxi provinces will be cut from five hours to only one. Passengers traveling between Taiyuan and Beijing will need only three hours, a saving of more than five hours. Airlines and bus companies, feeling the pinch from the new railways, are cutting prices. Wuhan-based Chutian Metropolis News reported that discounts of up to 70 percent will be given to flights from Wuhan to Shanghai starting April 1. The cost of a bus ticket will be reduced from 185 yuan ($27) to 90 yuan tomorrow. Starting next month, the ministry will add 89 pairs of passenger trains on a number of popular routes, increasing passenger capacity by 10.6 percent, Zhang said. The ministry is also considering selling train tickets by phone and via the Internet, with regions such as Guangdong and Chongqing piloting the practices, he said. China opened its first high-speed railway, the 350-kph Beijing-Tianjin route, last year. At present, 200 bullet trains are zipping through major cities in China, Zhang said, with 600 more expected to be on the tracks by 2012, when China's high-speed rail network takes shape and securing a train ticket in peak travel seasons will no longer be a problem. Some of the bullet trains will have sleepers for travelers. In December, the ministry put such trains on the Beijing-Shanghai and Beijing-Hangzhou railways, charging a record 600 to 700 yuan for a sleeper ticket. While many doubted the popularity of such trains, Zhang said an average occupancy rate of 70 percent is good enough. "Passengers will see more half-empty trains than crowded ones in the future, thanks to the progress of longer railways and better and faster trains," he said.